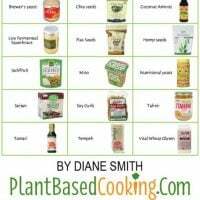 Why does it seem that many plant-based recipes have such strange and uncommon ingredients? 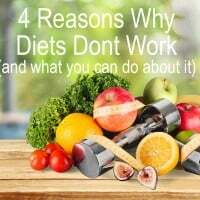 The main reasons are that they are great for getting the right nutrition and are often substitutes for the missing protein you get from meat and dairy. Some are for flavor and health. Protein sources or substitutions: several of these uncommon ingredients are great sources of protein, which, as you probably know, is an important nutrient needed by the human body. Take out the meat and dairy and you'll want to add back in these sources of healthy protein such as seitan, tofu, soy curls, tempeh, or vital wheat gluten. 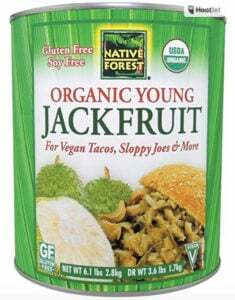 Jackfruit, while not high in protein is a great substitute for meat. We don't really need as much protein as we think and for more on that read my article, "Am I Getting Enough Protein on a Plant-Based Diet?" Vitamin B: yep, nutritional yeast, sometimes called nooch, is a great source of Vitamin B12 which is lacking on a plant-based diet. Flavorings: Miso, coconut aminos, liquid aminos add flavor and are a better source for saltiness. Seeds: Tahini is made from sesame seeds, and hemp and flax are all seeds and we know now that seeds and nuts are a great source of vitamin E, and other nutrients, and are important for maintaining health. In fact, nuts and seeds can aid weight loss. This sauce often used to flavor foods, is a soy-sauce alternative. It’s made from non-GMO soybeans and purified water and contains 16 amino acids, including the 9 that are considered essential. It’s a nice seasoning agent for things like rice, beans, vegetables, and salads, and can be used to replace soy sauce in any recipe. It’s gluten-free and has no added chemicals, colors, or preservatives. 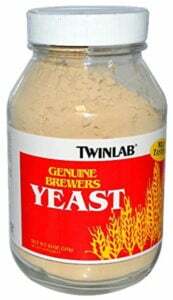 Brewers Yeast is a flaky substance that is a by-product of beer making and is very similar to nutritional yeast. It is added as a supplement to food to increase its nutritional value. It mostly contains B vitamins, which can be lacking in a vegetarian or vegan diet, as well as also containing chromium, selenium, and magnesium. It is usually available in health food stores. It is less palatable than nutritional yeast. Chia seeds are from the Salvia Hispanica plant and are a good source of fiber, protein, and minerals and most notably, omega-3 fatty acids. They may be eaten whole, unlike flax seeds, that need to be eaten ground for their nutrition. For 1 egg substitute, add 1 tablespoon of chia seeds to 3 tablespoons of water and let sit for about 5 minutes. Coconut aminos are made from the sap of the coconut tree and can be used in a similar fashion as Bragg’s aminos. Though they have a slightly sweeter taste than Bragg’s, they’re a good soy-sauce alternative for those who cannot eat soy. This condiment is high in antioxidants, and contains all the essential amino acids, containing 17 amino acids in total. It’s also low on the glycemic index and contains several minerals and vitamins, including vitamin C and several B vitamins. The seed of the common flax plant. The seeds and oil are a rich source of alpha-linolenic acid and omega-3 fatty acids. Flax seeds need to be consumed ground to obtain their nutritional value. They are often used as a substitute for eggs when mixed with water. Jackfruit is actually a fruit and the largest in the world. Its unique quality of being shreddable lends itself to being a meat replacement. Most often found canned, the best to purchase is the version that is young, green & in water. You can find it in Asian grocery stores or online. If you find a fresh jackfruit, don't buy the ripe version because it's too sweet. Jackfruit has a core, much like a pineapple and large seeds that need to be removed before cooking unless the seeds are tender. It's usually marinated to bring out the flavor on the dish you're preparing. Hemp seeds are another great source of omega-3 fatty acids, both LA and ALA, and have a great balance of omega-3 to omega-6 fatty acids, at a 3:1 ratio. They also contain 20 amino acids, including all 9 of the essential amino acids, making them a wonderful protein source. A three-tablespoon serving provides 10 grams of protein, 14 grams of healthy fats, and 2 grams of fiber. They are also vitamin-and-mineral-rich and are an excellent source of vitamin A, several B vitamins, vitamin D, vitamin E, calcium, iron, magnesium, potassium, and zinc, to name a few. Miso is a paste made from fermented soybeans and barley or rice malt. It is traditionally used in Japanese cooking and also added to vegetarian or vegan meals as a flavor enhancer. It can be found in the refrigerator section of your health food or Japanese store. Nutritional Yeast is a flaky, almost cheesy tasting substance that is grown on molasses. It is usually added to food as a supplement to increase its nutritional value. While it does contain B vitamins and magnesium, it is not a good source of selenium or chromium like Brewers Yeast. It is usually available in health food stores. It may also be called nooch. Seitan: Seitan is another protein-packed meat alternative. A 100g serving has 16 grams of protein and contains all the essential amino acids except lysine. Combine it with something like mung bean sprouts or season it with some brewer’s yeast or liquid aminos, and you have a complete protein. It’s also low-calorie, with that same 100g serving containing only 120 calories. It’s also high in vitamin C, thiamin, riboflavin, niacin, and iron. 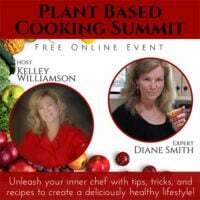 Learn about cooking with seitan here. 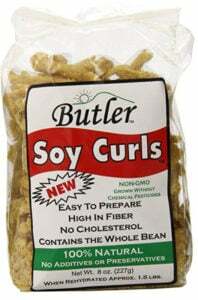 Used as a meat substitute, soy curls are gluten-free and are made from the whole soybean. They are organic, preservative free and are dried. Upon rehydration, soy curls resemble chicken. They can be found in most Whole Foods Markets or at other locations. A Middle Eastern paste or sauce made from ground sesame seeds. It is usually found in the aisle with the nut butters. Tempeh is made from cooked and slightly fermented soybeans and formed into a patty, similar to a very firm veggie burger. Many commercially prepared brands add other grains, such as barley, and also add spices and extra flavors. Although tempeh is made from soy, it has a unique taste and is mildly flavorful on its own, unlike tofu. It is found in the refrigerator section of most health food stores. Learn about cooking with tempeh here. Vital wheat gluten is made from gluten and is a powdered form of the protein in wheat without any starches. It is used to make seitan (say-tan), but they cannot be used interchangeably. It is also used as a binding agent for breads, burgers, or loaves. 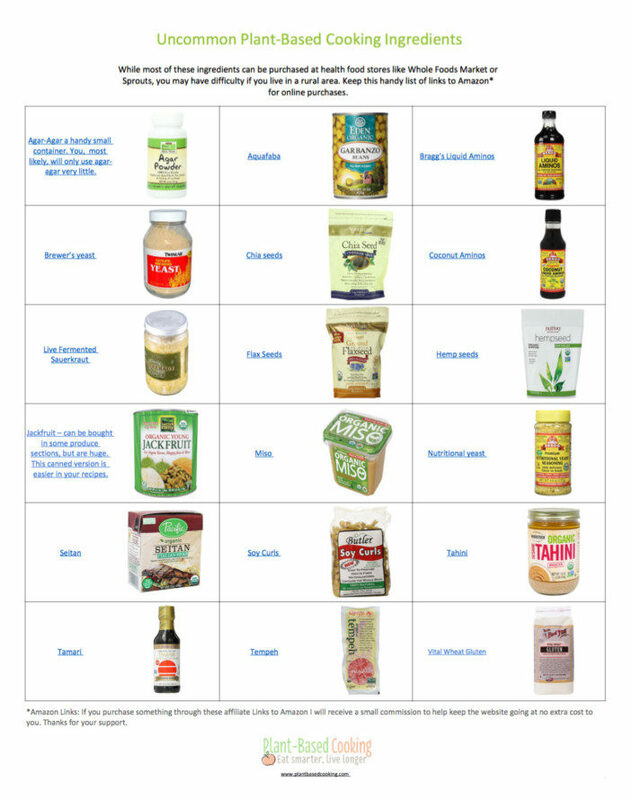 It can be purchased from specialty or health food stores or online. So, there you have it! A pretty comprehensive guide to the lesser-known ingredients anyone on a plant-based diet might want to get to know. What are some of your favorite ingredients and foods that you consider unusual? Let me know in the comments below, and thanks for reading! *Amazon Links: If you purchase something through these affiliate Links to Amazon I will receive a small commission to help keep the website going at no extra cost to you. Thanks for your support.